Cathole Cave (G-B): oldest rock art in the British Isles? 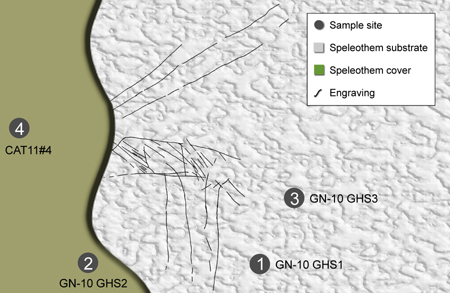 Minimum U-Series date makes Welsh discovery the oldest rock art in the British Isles (and North-western Europe). In September 2010, Dr George Nash from the Department of Archaeology & Anthropology was exploring the rear section of Cathole Cave, a limestone cave that stands on the eastern side of an inland valley on the Gower Peninsula, South Wales. Discovered to the rear of the cave on a small vertical limestone niche was an engraved cervid, probably a stylised reindeer. This side-on view figure, measuring approximately 15 x 11cm, was engraved using a sharp pointed tool, probably made of flint and carved by an artist using his or her right hand. The elongated torso had been infilled with irregular-spaced vertical and diagonal lines, whilst the legs and stylised antler set comprised simple lines. The engraved was over a speleothem substrate, which itself had developed over a large piece of limestone. Extending over the left side of the figure was a flowstone deposit (speleothem cover) which extended across part of the cervid's muzzle and antler set. In April 2011 members of the NERC-Open University Uranium-series Facility (Dr Peter van Calsteren and Dr Louise Thomas) extracted three samples from the surface of the speleothem cover; one of these produced a minimum date of 12,572 + 600 years BP (CH-10 GHS2). A further sample was taken in June 2011 from the same flowstone deposit which revealed a minimum date of 14,505 + 560 years BP (GN-10 GHS2). The earlier date is comparable with Uranium Series dating of flowstone that covers engraved figures within Church Hole Cave at Creswell along the Nottinghamshire/Derbyshire border. However, the new minimum date of 14,505 + 560 years BP makes the engraved reindeer in South Wales the oldest rock art in the British Isles, if not North-western Europe.